International Data Week entitled "Digital Frontiers of Global Science" will come for the first time to Africa and will comprise SciDataCon (a conference for research and practice papers addressing all aspects of data in research), and the 12th Plenary Meeting of the Research Data Alliance (RDA). As one of its major themes, the International Data Week will be focused on issues around Data for the Sustainable Development Goals (SDGs) & Data for innovation. To avoid the clash with the UN World Data Forum (22-24 October, 2018) and the Plenary Meeting of the Group on Earth Observations (31 October - 1 November, 2017) including major flagships, the Data Sharing Working Group and AfriGEOSS, the date for the International Data Week is shifted to 5-8 November, 2018. The deadline for session proposals for SciDataCon has been extended to Friday 2 February 2018. Please consult the conference themes here. 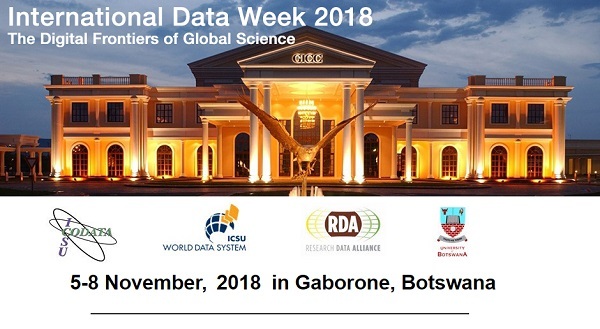 Related events associated with CODATA, ICSU-World Data System, RDA and the Botswana Open Data Open Science Forum will change dates accordingly. ... to be approved by the 31st CODATA General Assembly held in Gaborone, Botswana, following International Data Week 2018, 9-10 November 2018 (comprising our research conference SciDataCon 2018). The final deadline for submissions of Task Group Proposals is 15 June 2018. Proposals will be reviewed by the CODATA Executive Committee and by external experts. Recommendations will be presented to the CODATA General Assembly which will select the Task Groups. Potential Task Groups are invited to submit draft proposals for comment by the CODATA Executive Committee. Such draft proposals should be submitted in the attached form to Simon Hodson, CODATA Executive Director simon@codata.org no later than 28 February 2018. Feedback will be provided no later than 30 April 2018. Task Groups are approved by the General Assembly for 2 years. Existing CODATA Task Groups may apply for renewal and are subject to the same criteria, as described in the attached document. exploring the theme of data diplomacy to consider what international agreements can promote the more open availability of data. examining and addressing issues around access to research software, the maintenance and development of Open Source research software. Task Group proposals addressing these or similar issues are particularly encouraged. This does not mean that Task Group proposals addressing areas not described below will be considered out of scope: we invite and encourage innovative ideas from the CODATA community. INVITATION ! INVITATION ! INVITATION ! INVITATION ! INVITATION ! INVITATION ! *** Invitation to the INTEREST GROUP in AGRICULTURAL DATA (IGAD) RDA Pre-Meeting P11 “The FAIR principles to all elements of the research process in agricultural sciences and related disciplines" (19-20 March, 2018, Berlin, Germany). Proposals are invited by 19 January 2018.